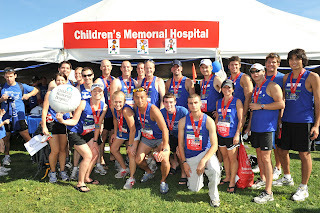 You read the announcement that the Chicago Marathon was open for 2010 registration, but you said you'd wait to sign up. You read the announcement that 30,000 had already registered for the race, but you put it aside and forgot about joining the ranks. You read the announcement that only 2,000 spots remained, but you told yourself you'd do it later. The only problem is that later never came because the race closed that afternoon. And now you were left with the puzzling thought of how to reach those marathon goals you had for the year without straying too far from home, having the advantage of a flat course mirroring your training grounds and knowing that every family member and friend would line the course to support you. Here's a simple solution to your problem: grab one of the marathon spots that are still available through a select number of charities. You'll get a spot into the race of your dreams and you'll be making a difference in the lives of others. It's a win-win situation and here are some of the charities that have availability--but they're going fast. Check into other charities that may still have available spots by visiting the Charity and Community section at the Bank of America Chicago Marathon's website. If you're wondering what's in it--besides fundraising for a worthy cause--for you, we've got that covered. Many of the charities provide an entry into the race (a $135 value) in exchange for you pledging to race a set amount of dollars for the organization. Not only that, but you can score free training through a running group like Chicago Endurance Sports or the Chicago Area Runners Association, fundraising tools, day-of race perks, group events to attend, and a T-shirt or singlet to show your support of the organization when you're out running. And the coolest part of all? You can say that you were part of the fundraising totals that are announced by the Chicago Marathon after the race is said and done. That means if you ran in 2009, you can brag that you were one of the more than 8,000 who contributed to the nearly $10 million that was raised. Wow! But don't forget to sign up soon. Photo provided by Children's Memorial Hospital.